Increase Longevity of Rubber Mulch by Using EPDM Wear Pads! JungleMulch sure is a great product, there’s no doubt about that! Its natural good looks are owed to an exclusive organic pigmentation colouring process, which means the colour is brighter and holds to the rubber far better than water-based alternatives. As with any product, there are ways to increase longevity of rubber mulch. At PlaySmart, we test our bonded mulch onto concrete to offer worst-case scenario which gives you and your client’s confidence in the real CFH of the product. Maintenance is very minimal with JungleMulch which may include pulling out any weed or grass growth which is actually quite normal as JungleMulch is a porous surface and growth can occur from natural migration. Over the years of the product being used, we have discovered first hand that the surface certainly stands up to these claims yet like any surface it can be prone to general wear and tear, particularly in high action areas. In an effort to increase the surface’s longevity we recommend using EPDM wear pads in high action areas such as under swing seats, at the end of slides or around roundabouts. It’s even more of a recommendation in play areas that are known to be used heavily in highly populated areas. Colour EPDM is renowned for having a high tensile strength. In less technical terms that means it’s a material that has a high resistance to breaking under tension. EPDM, therefore, lends itself perfectly to creating Wear Pads in JungleMulch surfacing and can be designed and laid in all colours, shapes and sizes. 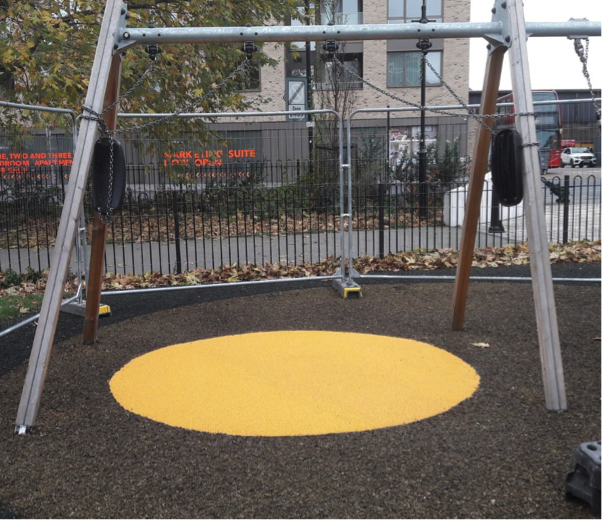 EDPM Wear Pad under double swing at Camberwell Green Play Area, London. 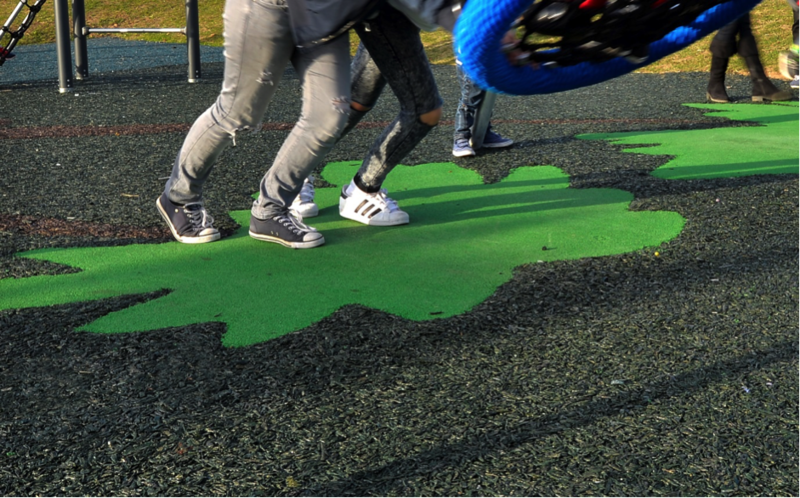 If you’re planning your JungleMulch surfacing project and would like to find out more about using EPDM Wear Pads and how to increase longevity of rubber mulch, please feel free to call us on 01564 742 811 or email enquiries@playsmartuk.co.uk. Alternatively, why not take a look at our free guide on how to choose a safety surface? To download, click below.